Six Americans were killed today in Afghanistan in two separate incidents. Five of them, including two civilians, were killed when their State Department convoy was struck by a car bomb as it headed to a local school to donate books to students. Another American civilian was killed in an insurgent attack in eastern Afghanistan. 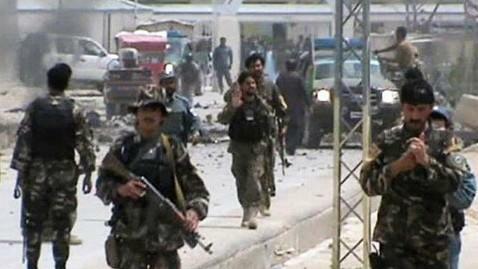 The bomb attack on the convoy took place in Qalat, the capital of the southern Afghan province of Zabul. The blast killed three American military service members, a female State Department Foreign Service Officer and a civilian working for the Department of Defense. Another 10 people were also injured in the blast including four additional State Department employees, one of them injured critically. In a statement Secretary of State John Kerry said the team was en route to a local school in Qalat to donate books to local students "when they were struck by this despicable attack." He praised the fallen State Department employee as "an exceptional young Foreign Service Officer" and said "our State Department family is grieving over the loss of one of our own." Kerry said he had met the unidentified Foreign Service Officer during his recent trip to Kabul "when she was selected to support me during my visit to Afghanistan." He described her as "everything a Foreign Service Officer should be: smart, capable, eager to serve, and deeply committed to our country and the difference she was making for the Afghan people. She tragically gave her young life working to give young Afghans the opportunity to have a better future." It remained unclear whether insurgents were targeting the American convoy or the governor of Zabul, who was nearby at the time of the attack. An Afghan police official told ABC News that the American convoy had pulled out of its Provincial Reconstruction base in the middle of the city of Qalat and was next to a convoy carrying the governor, who was on his way to open up a school when a car sped into the combined convoy and exploded. Another American civilian was killed in a separate insurgent attack in eastern Afghanistan, U.S. Forces Afghanistan said in a press release today. A NATO press release about the Zabul attack indicated that two "coalition civilians" had been killed. A short time later the U.S. Embassy in Kabul released a statement confirming that there were American and Afghan casualties in the attack. That led to speculation that one or both of the civilians mentioned in the NATO press release worked for the State Department. Located north of Kandahar, Zabul has not had much of a U.S. military or civilian presence in the 11 years that U.S. forces have been involved in Afghanistan. That started to change as the number of troops there increased after the military and civilian surge approved by the Obama administration in late 2009. Earlier this year there were only a handful of American fatalities, partly because of the lull in fighting during the winter season and the ongoing transition that is placing more Afghan military forces in the lead for security in most of the country. In late February, there was a 30-day gap in between U.S. military fatalities, the first time such a gap had occurred in six years. By March however, U.S. military fatality numbers spiked back to levels seen in previous years. While the number of American and NATO fatalities has decreased, NATO officials have expressed concern about significantly higher fatality rates among Afghan security forces during the same time period. In early March, Gen. James Mattis, the former commander of U.S. Central Command told a congressional committee that at the time four American military service members had died in Afghanistan while 198 Afghan forces had died during the same time period. He attributed that to the fact that Afghan forces were now doing much of the fighting in Afghanistan as the U.S. military moves toward a combat support role. The Associated Press reports that by their count, there have been six foreign civilians killed in Afghanistan this year. The U.S. and NATO intend to pull out all of their combat forces by the end of 2014, though it remains to be decided how many training troops will be left after that date.